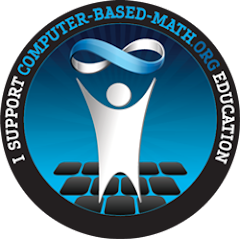 From the web site's About: "GeoGebra is dynamic mathematics software for all levels of education that joins arithmetic, geometry, algebra and calculus. On the one hand, GeoGebra is an interactive geometry system. You can do constructions with points, vectors, segments, lines, conic sections as well as functions and change them dynamically afterward. On the other hand, equations and coordinates can be entered directly. Thus, GeoGebra has the ability to deal with variables for numbers, vectors and points, finds derivatives and integrals of functions and offers commands like Root or Extremum. These two views are characteristic of GeoGebra: an expression in the algebra view corresponds to an object in the graphics view and vice versa"
Truth is, GeoGebra is impossible to describe. You need to see it in action. The web site has many examples, as does www.john-burke.net. Note that GeoGebra is free and is actively being enhanced. You can install GeoGebra on any PC or Mac (it is completely written in java), run it through a browser, or even run it off a thumb drive. The best way to learn to use GeoGebra on your own is to download the examples and then run the the Construction Protocol step by step (not the algebra window, but View -->Construction Protocol). For my colleagues at ARC, I will be giving a short presentation on GeoGebra Thursday, 8/20 and Friday, 8/21 at the Math Department meetings. For my colleagues at Sierra College, I will be giving a four hour hands on tutorial Tuesday, 8/25 from 1 - 5PM where you can (will) learn to use GeoGebra and leave with several constructions you can use in your classroom.